This month North Carolinians are raising their glass to NC craft beer! Throughout the month of April, beer connoisseurs, professional brew masters, amateur brew masters, and even those people who simply enjoy the taste of a delicious craft brew will acknowledge and celebrate North Carolina brewed beer. With more than 60 microbreweries across the state, North Carolina is currently home to more breweries than any other state in the South. With that being said, the Outer Banks of North Carolina is lucky enough to be home to a few very unique breweries that are special in their own right. Introducing North Carolina’s oldest continuously operating brewery in the state – Weeping Radish Brewery, Farm, & Butchery in Grandy, NC. On July 4th, 1986, Weeping Radish opened for business in the heart of Manteo after the owner, Uli Bennewitz worked with his local senator to pass a bill that would allow microbreweries to sell their own beer on site after 25 years of not being able to do so. In 2006, Weeping Radish Brewery, Farm, & Butchery moved to their Eco Farm in Currituck County. True to his German roots, Bennewitz’s beer has always adhered to the German Reinheitsgebot Purity Law of being all natural and unfiltered with no chemicals or preservatives. 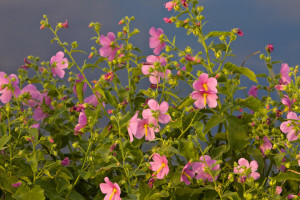 Next time you’re traveling to the Outer Banks, stop by for a $5 brew tour on Wednesdays at 11am and sample the beer that NC beer writers, Win Bassett and Anne-Fitten Glenn selected as their “not-to-miss-tap,” Weeping Radish’s Black Radish Dark Lager, a dark German lager-style brew. A little farther down the road is Outer Banks Brewing Stationin Kill Devil Hills, the nation’s 1st wind-powered brewery! In 1992, Peace Corp volunteers, Eric Reese, Aubrey Davis, and Tina Mackenzie brainstormed ideas based on their current interests and talents and envisioned an environmentally conscious restaurant and brewery. Eric’s love of the Outer Banks began during summers spent with his grandparents, which led to an interest from all parties of following through with their vision and making things happen! The Brewing Station’s brew master, Scott Meyer out of Berkeley, California, is on hand for brew tours Fridays at 3pm. Formerly a vintner, Scott is a national and international gold medal winner in brewing competitions. Check out the brew master’s blog for a glimpse behind the scenes! Check out their current beers on tap . And last, but certainly not least (depending on your point of entry to the Outer Banks) is Full Moon Café and Brewery in downtown Manteo. This unique, upbeat eatery opened its doors in the fall of 1995 and has since added the brewery to its offerings. Specializing in British and Irish-style ales and stouts, Full Moon Café and Brewery uses a one barrel RIMS system filling one and two barrel fermenters. Sign up for a brew tour before venturing to Roanoke Island and be sure to sample some of their delicious brews such as Lost Colony Ale, Baltimore Blonde, and Charon Stout. After the tour, dine with Full Moon Café and Brewery in charming downtown Manteo and be amongst the list of famous Full Moon patrons, such as Richard Gere, Jimmy Buffet, and Edward Norton. Whether you share a love of craft brews or simply find the history of breweries intriguing and the craft of brewing just as interesting, we hope that you enjoy or have developed a new found fondness for NC crafts brews and the fine folks behind the more than 60 breweries across the state! Starting Friday, April 19th, Bodie Island Lighthouse will open to the general public for climbing tours for the first time ever! The lighthouse, currently located on National Park Service property, was operated and maintained by the United States Coast Guard (USCG) until the year 2000. At that time the USCG tranferred the lighthouse over to the National Park Service and three years later, the USCG transferred over the first-order Fresnal lens as well. A chat with a few Outer Banks natives might reveal a time when the USCG informally allowed “locals” to the climb this familiar, horizontally striped black and white beacon. A recent renovation of the lighthouse and its first-order Fresnal lens was completed and guided tours will be conducted daily from 9am to 5:45pm, starting April 19th, 2013 through Columbus Day, October 14th, 2013. On April 19th, the National Park Service invites local community members and visitors to tour/climb the lighthouse at no charge. Free tickets will be available on a first-come, first-served basis and can only be obtained in-person, on-site, that day. Be sure to add the Bodie Island Ligthhouse to your vacation itinerary for a memorable and unique experience! 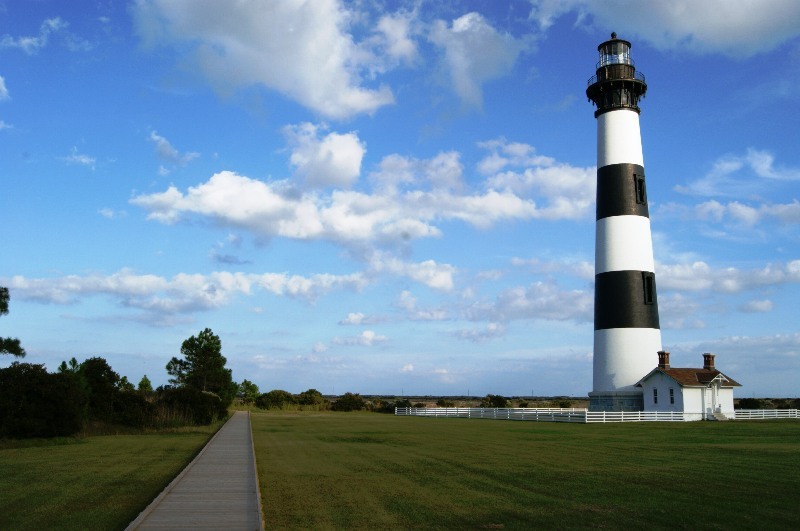 Guided tours for the Bodie Island Lighthouse will run from 9:00 a.m. to 5:45 p.m. Tickets are $8 for adults and $4 for senior citizens (62 or older), children 11 years of age and under, and for those holding a National Parks and Federal Recreation Lands Access Pass. Tour tickets may be purchased on site the day of the tour or may be reserved in advance. Tours start every 35 minutes and are 45 minutes in length. Each guided tour is limited to 22 people. Children must be at least 42″ tall. Children under 12 must be escorted by a person at least 16 years old. For additional tour information, check the park website at www.nps.gov/caha. Tour start times are 9:00 a.m., 9:35 a.m., 10:10 a.m., 10:45 a.m., 11:20 a.m., 11:55 a.m., 12:30 p.m., 1:05 p.m., 1:40 p.m., 2:15 p.m., 2:50 p.m., 3:25 p.m., 4:00 p.m., 4:35 p.m., 5:10 p.m., and 5:45 p.m. daily, seven days a week. •	Day of Tour Tickets: 50% of all tours for each day will be sold on site. Day of tour tickets are available on a first-come, first-served basis and can only be purchased in-person at the site the day of the tour. Day of tour tickets will be available from 8:30 a.m. to 5:30 p.m. starting April 19. •	Reserved Tickets: 50% of all tours for each day will be sold in advance. Reservations for a tour can only be made between one to seven days in advance of the tour date by calling (252) 475-9417. The reservation office opens on April 22 and is open 11:00 a.m. to 4:00 p.m., seven days a week. Reservations cannot be made the same day as the tour date. Today, April 1st, marks the opening day of the 2013 season at Chicamacomico Life-Saving Station, the first operational life-saving station in North Carolina! Located in Rodanthe, NC, Chicamacomico Life-Saving Station and Historic Site is the scene of the most highly-awarded maritime rescue in American history, the SS Mirlo! You’ll have a chance to tour one of the few USLSS sites in the nation with all of its original builidings, including the 1874 Life-Saving Station, the Drill Pole, the 1892 Cook House, the 1907 Midgett House, the 1911 Cook House, the 1911 Life-Saving Station, and the 1911 Horse Stable. It’s the largest, most complete USLSS complex in the nation and 1 of only 2 1874 USLSS stations in the nation open to the public. The complex is open Monday-Friday, 10am to 5pm for self-guided tours. Admission is $6 per person or $4 for seniors (65+) and students. Be sure to check out the Chicamacomico Life-Saving Station Calendar of Events for Summer Porch Program dates, the Beach Apparatus Drill, and American Heroes Day! 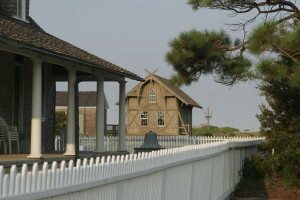 The Chicamacomico Historical Association is a private, 501(c)(3) non-profit organization whose purpose is to restore, preserve and interpret the buildings and history of Chicamacomico Life- Saving Station, as well as the U.S. Life-Saving Service and its successor, the U.S. Coast Guard on the Outer Banks. The Association owns and operates the museum site and the museum shop and raises its own funds. 100% of all admission fees, gift shop purchases, memberships, and donations go directly to the preservation, restoration, and operation of this historic site. Exciting plans are underway to open the first phase of the Hatteras Island Ocean Center this Spring in the former Beacon Shops located on NC Hwy 12 in Hatteras Village. 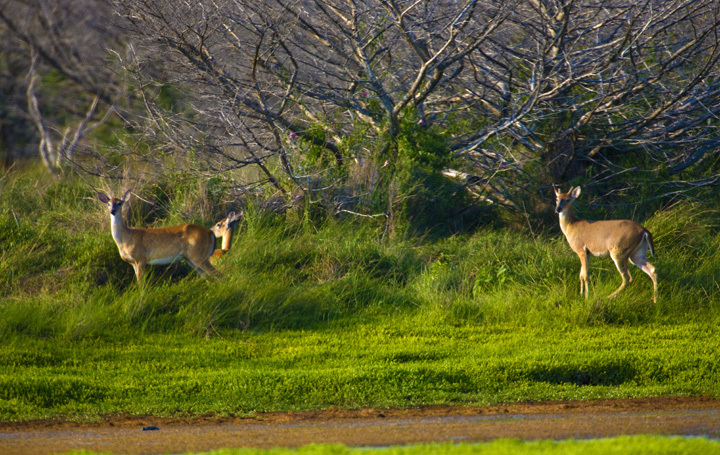 The first phase of this multi-year project includes an interactive information and education center, as well as wetland trails for exploring the unique ecology of Hatteras Island. This series of noninvasive trails will lead to a launching area for kayaks and paddleboards at trail’s end. The Ocean Center headquarters will house exhibits on the varied components of Hatteras Island’s ecosystem. These interactive exhibits will focus on marine life, shipwrecks, weather, shellfish, salt marsh ecology, and of course, sea turtles! 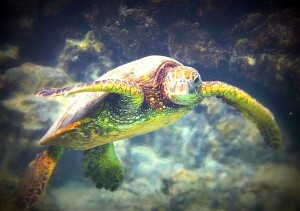 As you enter the Center, a “larger than life” screen will display the underwater photography of local artist, Russell Blackwood. Next, head to the exhibit on sea turtles which will include a machine that simulates x-rays and probes, allowing visitors to learn about the biology of sea turtles while making the connection between sea turtle maladies and the environment’s impact. In addition to playing “Sea Turtle Veterinarian,” visitors will have an opportunity to learn about nesting habits and rehabilitation procedures for the sea turtles of Hatteras Island. From there, visitors can explore a fishing exhibit set up in conjunction with the Graveyard of the Atlantic Museum and Captain Ernie Foster of the Albatross Fleet. This exhibit will focus mainly on charter and commercial fishing, with the addition of beach and pier fishing in the future. As you make your way back around to the entrance, take a minute to check out the interactive whiteboard with daily updates on weather, tides, and island happenings. If you’d like to enjoy a Hatteras Island Ocean Center souvenir, choose from a few Ocean Center choice goods and be on your way to explore the wetland trails! The second phase of the Hatteras Island Ocean Center will include a state-of-the-art pier and pier house located on NC Hwy 12 in the same vicinity as the former General Mitchell Motel in Hatteras Village. The pier house is expected to include a restaurant, other food vendors, a covered playground, an arcade, a public bathhouse, tackle shop, equipment rental, indoor and outdoor exhibits, classrooms, research areas, and a wildlife rehabilitation area. This phase is still in the very beginning stages as funding is being pursued. Sea Turtle Egg Hunt, NC Aquarium on Roanoke Island. Children will take part in a sea turtle program, come face to face with a young loggerhead turtle, and make a craft to take home. The program will conclude with an egg hunt on the Aquarium grounds as children search for eggs filled with treats! Event will be held rain or shine. $10, limit 25 participants. For ages 3-7. March 23 at 10:00 and March 30 at 9:30 & 11:00. Click here to reserve a spot! Paint a Beach Scene on ceramic for ages 7 and up, 4pm, Studio 12, Avon. Carolyn will walk you through step by step on how to paint a beautiful beach scene on ceramics with glazes. $15 plus pottery ranging from $15 to $32. Click here to register. Glass Fusion Jewelry for ages 9 and up, 4pm, Studio 12, Avon. Choose colorful eye popping jewels such rings, earrings or pendants. Class is $26 and includes all materials. Students can make more than one item for additional charge. Click here to register. 10 Year Anniversary Party, 3-6pm, Studio 12, Avon. Easter Arts & Crafts Show, Indian Town Gallery, 10am-5pm, Frisco. Fly Into Spring and Easter Eggstravaganza, Jockey’s Ridge Crossing, Nags Head. Kick off the 2013 season with Kitty Hawk Kites! The Kite Festival will take place on both Friday and Saturday from 10am-4pm at Jockey’s Ridge State Park, the largest living sand dune on the East Coast! 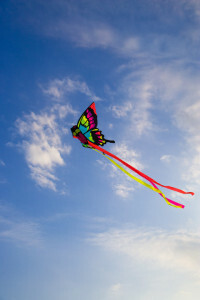 Enjoy fresh spring air, high flying kites, and all around fun on the dunes. The Easter Eggstravaganza will take place at Jockey’s Ridge Crossing Shopping Center, across the street from the Kite Festival. The Easter Egg Hunts start at 11am on both Friday and Saturday. 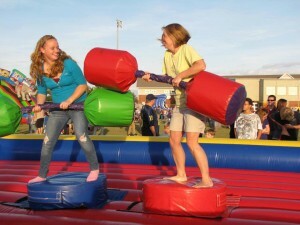 The hunts will be broken down by age groups: 6 & under and 7& up. Stick around for a picture with the Easter Bunny from 12:00-1:00pm. Both events are FREE TO THE PUBLIC. Easter Eggstravaganza, Elizabethan Gardens, Manteo. 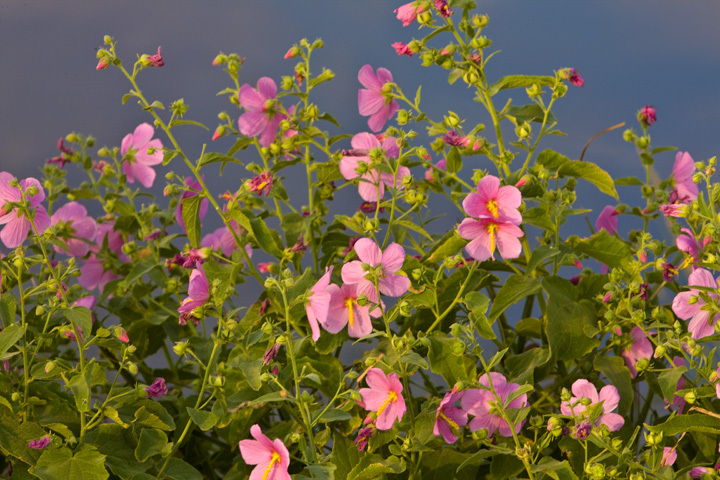 From 10am-2pm, participate in an Outer Banks spring tradition held in the midst of the beautiful spring blooms featuring an egg scavenger hunt, photo opportunities, a homemade bake sale, egg roll on the Great Lawn, story time, educational crafts, games, an Easter bonnet and hat contest, and more kid-geared fun. Easter Eggstravaganza, Frisco Mini Golf and Go Karts, 1pm. Easter sunrise services at Chicamacomico Lifesaving Station Historic Site, Avon Pier, and the former Lighthouse site in Buxton at 6:30am. 7th Annual Hoppin’ Easter Egg Hunt, 11am-2pm, Avon. Chicamacomoico Life-Saving Station Historic Site and Museum OPENS for 2013 Season! What exactly is a storytelling festival? It’s often an annual event that features local, regional, and/or nationally recognized oral storytellers. Each storyteller is allotted an amount of time to share stories with their audience. The featured storytellers are often professional performing artists however; semi-professional or amateur storytellers may also be included in the festival. 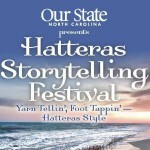 What should you expect during the inaugural Hatteras Storytelling Festival? 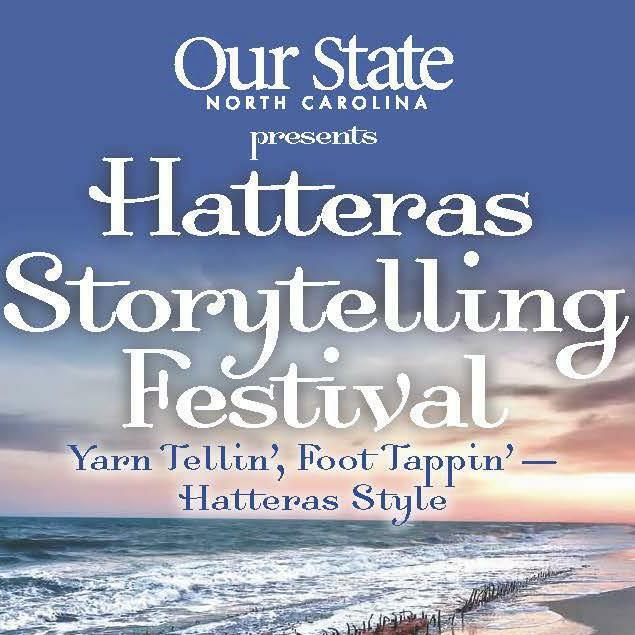 The first-ever Hatteras Storytelling Festival, May 3rd-5th in Hatteras Village, will be a unique event for the Outer Banks as nothing like this has been done before on such a large scale. The 3-day festival presented by Our State magazine will feature one of America’s most celebrated storytellers, Connie Regan-Blake, as well as many other well-known and local storytellers alike. In addition to yarn tellin’, live music will be provided by Clifford Swain and Banjo Island for foot tappin’ Hatteras style! You will also have the opportunity to explore the quaint village of Hatteras. Make plans to visit local shops and galleries, enjoy Hatteras Island cuisine at local eateries, and mingle with local islanders. Sunday only: FREE! Those with full festival weekend tickets will receive top priority to Sunday’s events. Stay tuned for updates as the festival quickly approaches! We look forward to seeing you in May! 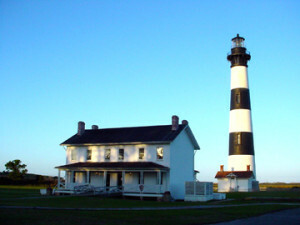 The National Park Service plans to open Bodie Island Lighthouse (pronounced “body”) to the general public for guided climbing tours in late April to early May 2013. Bodie Island Lighthouse, located north of Oregon Inlet, has undergone an 18-month long restoration project aimed to restore and preserve this historical beacon and make it accessible to the general public after being closed for many, many years. The beacon you see today as you enter the Cape Hatteras National Seashore, north of Oregon Inlet, was rebuilt in 1871 after being demolished during the Civil War in 1861 by retreating Confederate troops who feared the Union would use it to their advantage for navigation. Upon reconstruction, Bodie Island Lighthouse was partly built using materials left over from the “newest” Cape Hatteras Lighthouse. Currituck Beach Lighthouse is considered its architectural twin. Stay tuned for the much anticipated opening date of the Bodie Island Lighthouse! In the meantime, visit the Bodie Island Lighthouse Visitors Center located in the Double Keepers’ Quarters, just 6 miles south of the Cape Hatteras National Seashore entrance. You might be LUCKY enough to be spending St. Patrick’s Day weekend on the Outer Banks…If this is the case, as luck would have it, there are a few festive events to attend so be sure to pack your green! Indian Town Art Gallery St. Patrick’s Day Sale: Friday and Saturday, March 15th and 16th, Frisco. The gallery will be open 10am-5pm with items marked 20-50% off with some items being offered below cost! St. Baldrick’s Day on Hatteras Island: Saturday, March 16th, 3-6pm, Avon Fire Station, 40159 Harbor Road, Avon. Help raise money for childhood cancer research! With a minimum $25 donation, participants will shave their heads to show support of children undergoing chemotherapy and will receive a 2013 St. Baldrick’s Day T-shirt! Bake sale goodies will be available for “non-shavees” as well! Don’t miss a fun event for a great cause! Be Brave and Shave!!! Sponsored by Avon Surf Shop and Kinnakeet Civic Association. For questions or more information about St. Baldrick’s Day, please call Jennifer Harmon at 252-305-2172. Beer Tasting: Saturday, March 16th, 4pm, Lee Robinson’s General Store, Hatteras. OBX Taste of the Beach: March 14-17th. Four Days of FOODIE fun! This grand food festival will feature awesome cooking classes, brewery tours and tastings, multi-course fine wine dinners, oyster roasts, new NC BBQ Showdown, tapas crawls, beer-pairing dinners, and much more! Come see why Coastal Living magazine named it one of the TOP TEN Seafood and Wine Festivals in the Country! Tickets and more information are available at www.obxtasteofthebeach.com. Kelly’s 24rd Annual St. Patrick’s Day Parade: Sunday, March 17th. We may not be full-blooded Irish, but we do host the largest St. Patrick’s Day Parade in North Carolina. Over 1,500 participants and approximately 10,000 spectators enjoy an afternoon filled with floats, live music, marching bands and creative marching, walking and motorized units. Wear your green and bring your luck to this Shamrock tradition. MP 11.5 – 10.5, Beach Road. 6th Annual Shamrock Car Show: March 14-17th, First Flight High School, Kill Devil Hills. Kelly’s 5th Annual Running of the Leprechauns 8K: Saturday, March 16, 8:30am. Runners and walkers embark on an 8K point to point course including road and trail, for a share of Kelly’s “pot of gold”, Green Glory and fun! Awards and post race celebration and hospitality is held immediately following the race at Kelly’s Tavern, Nags Head. Click here for more info.